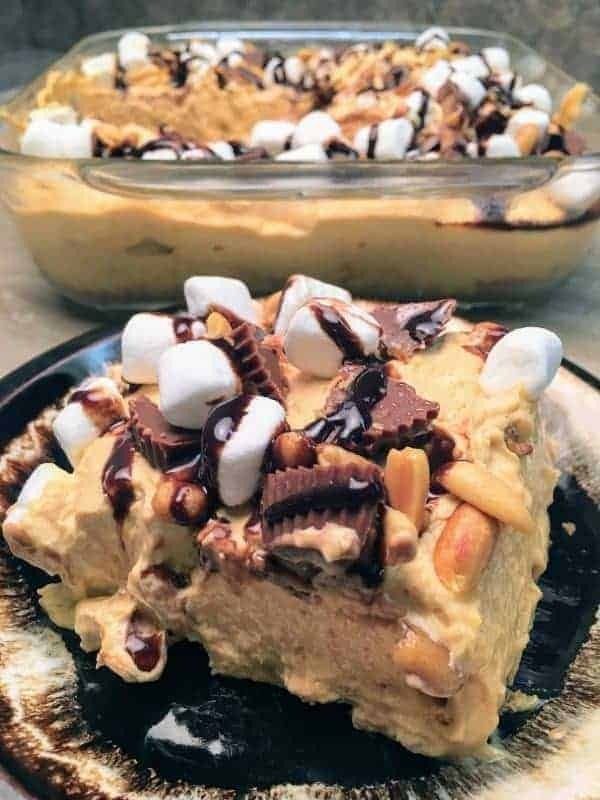 Reese’s Peanut Butter Pudding Dessert is a combination of salty and sweet creaminess that melts in your mouth. Don’t you just love family? I had a chance to chat with my Great Aunt Ree yesterday on the phone. She will be 90-years-old this month! She is a blessing in so many ways. Aunt Ree is my grandmother’s sister. Over the years, I have made so many precious memories with her. When we talk, we always talk about family – one of my favorite subjects. I always ask her a million questions about relatives, and I love to hear her stories. One of my other favorite subjects to talk about with her is food. I remember, years ago, sourdough starter sitting on the counter in her kitchen. I always thought that was the neatest thing. Even these small things are good memories. It’s what brings us together and binds our hearts. What are some of your favorite memories of your family time with others? Did you swap recipes? Be sure to comment down below or send me an email! Speaking of delicious recipes, you are gonna love this one. 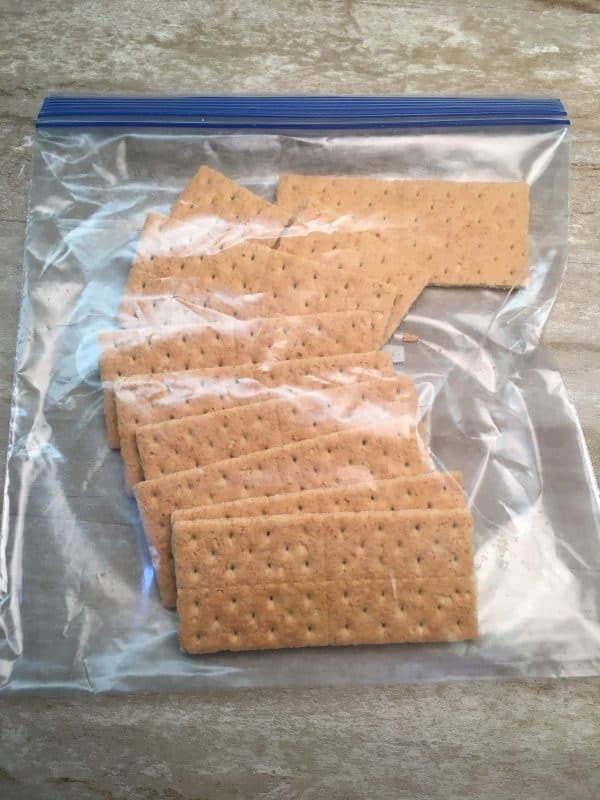 Grab a pack of graham crackers and place them inside of a large plastic bag and crush them up. I used nine, but I really only needed about eight crackers. If they kids are home I let them crush them up. I can be assured they will be nice and fine when the boys get done with it. Next, spray a baking dish with some nonstick spray and pour the crushed graham crackers into the pan. Then pour the melted butter on top and mix up the crackers until they are coated with butter. Press them down into the pan and bake for approximately 10 minutes on 350-degrees. 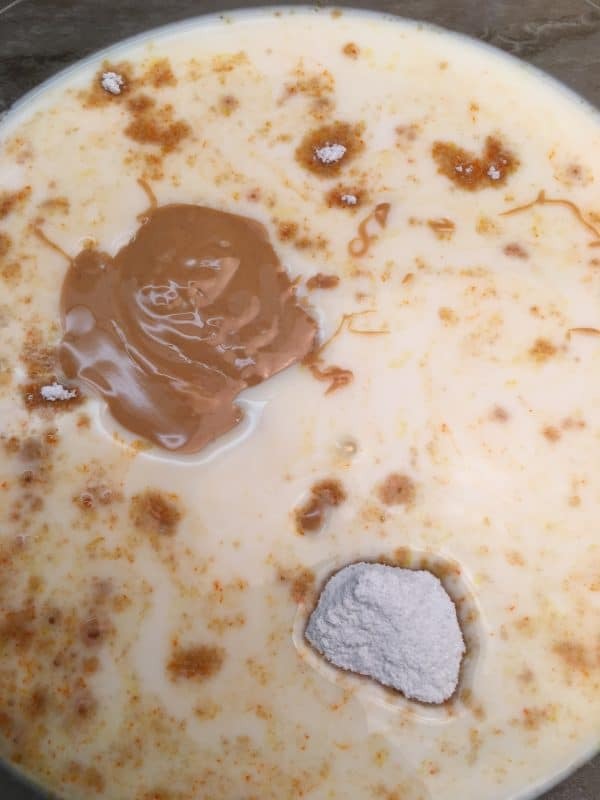 In a large bowl, add the milk, butterscotch and vanilla instant puddings, and melted peanut butter. 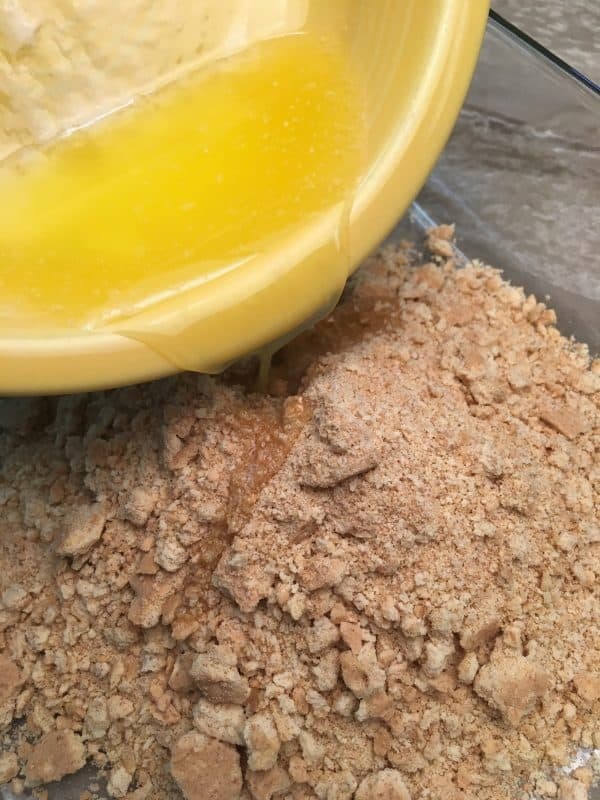 Stir the mixture until the pudding starts to thicken. It’s tempting to stand there with the bowl and a big spoon, but hold off until the dessert is done. It’s worth it. But, one spoon full never hurt anyone. Add the thawed whipped topping to the bowl and mix in. The whipped topping will be frozen when you buy it. If you forget to set it out (which I do every time), don’t worry about it. 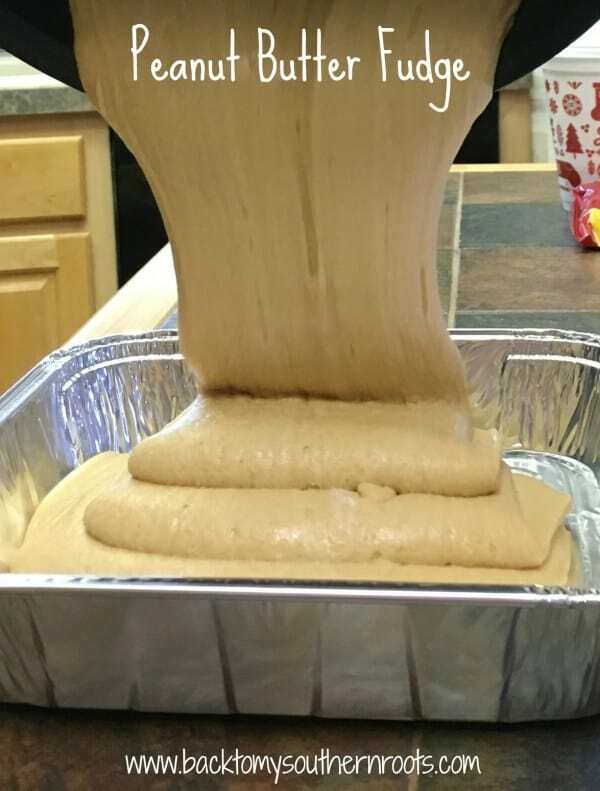 You will just need to stir the mixture a little longer. 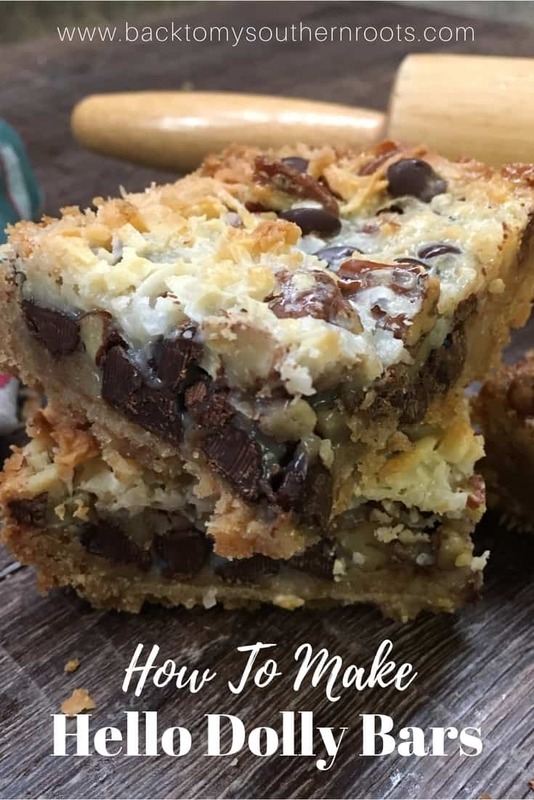 Once you have everything mixed together, pour the pudding mixture on top of the baked graham cracker crust and smooth it out. Cut up your Reese’s Peanut Butter cups into smaller pieces. (I bought mine at Aldi’s and got a great price). 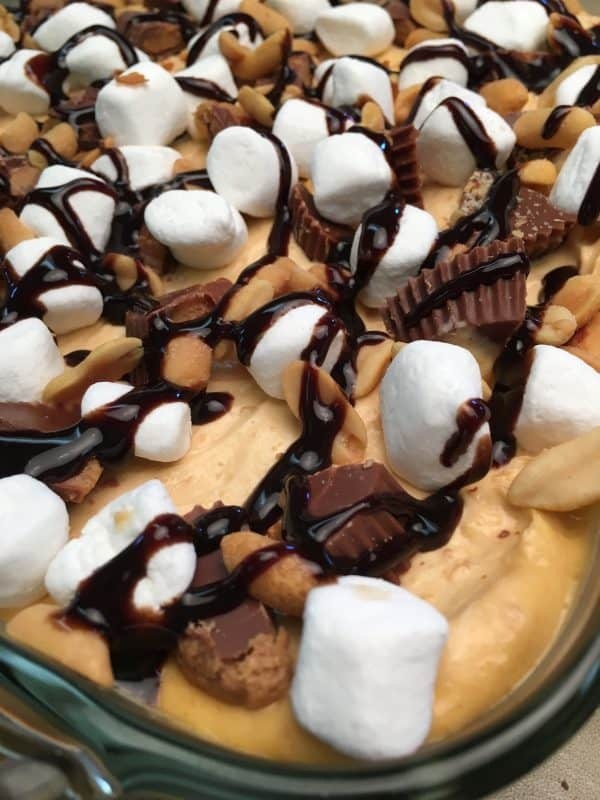 Sprinkle the Reese’s Peanut Butter cups on top. 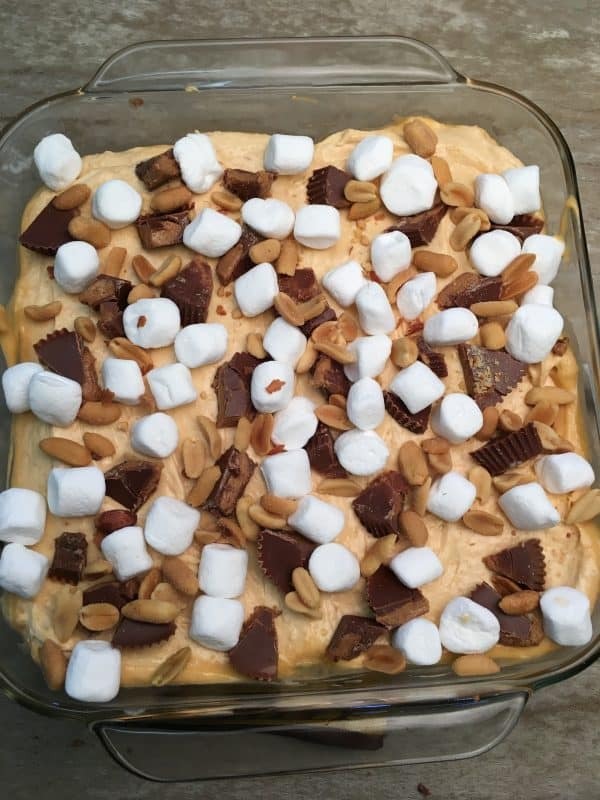 Then, add the mini marshmallows and peanuts. This is the fun part. And, then add the chocolate syrup on top. It’s really up to you how much you put on top. You can add more or less of any of these yummy treats to the top. I think this calls for a close-up. Don’t you? Place it in the freezer for about five hours. 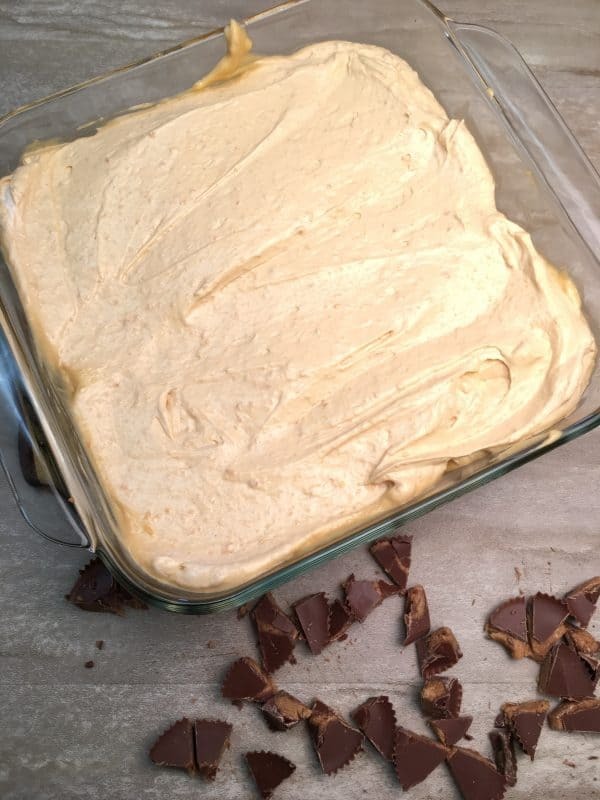 Once you’re ready to serve the dessert, place it on the counter for about 20 minutes to let it thaw out a little before slicing it. My family absolutely loved this dessert. 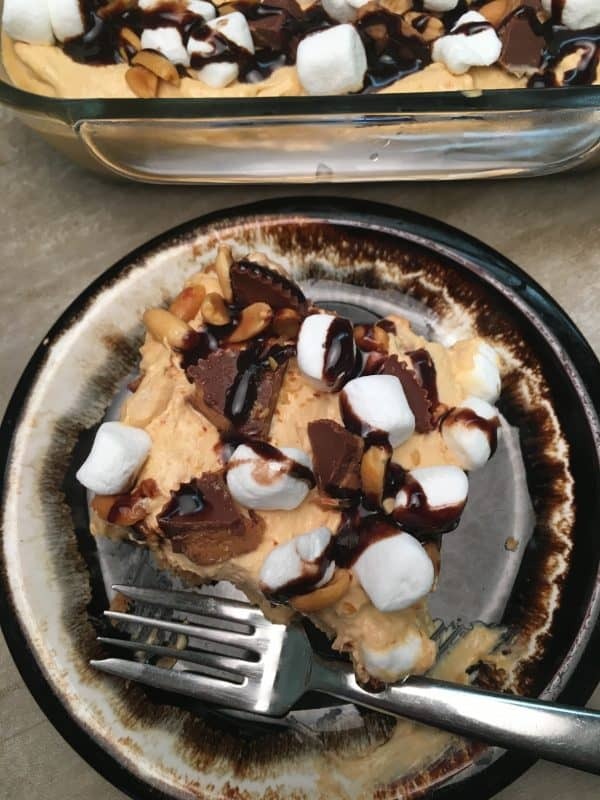 My husband repeatedly told me how much he liked it and he’s a little harder to please with desserts. I gave a piece to one of the kids down the street and he ate every bite! This recipe is adapted from a Pampered Chef recipe. Place the Reese's Peanut Butter Cups in the refrigerator to harden them before cutting. Spray a 9" x 9" baking dish with nonstick spray. 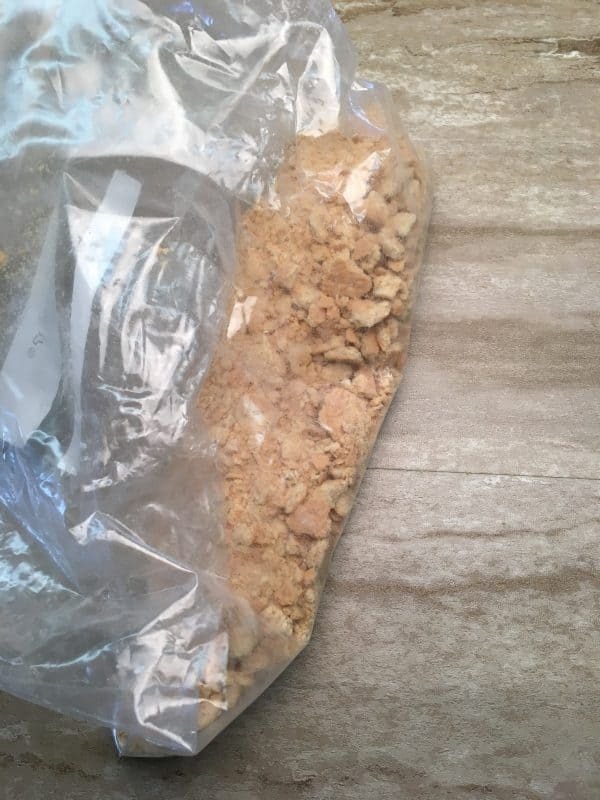 Crush the graham crackers in a large plastic bag. Add to the baking dish. 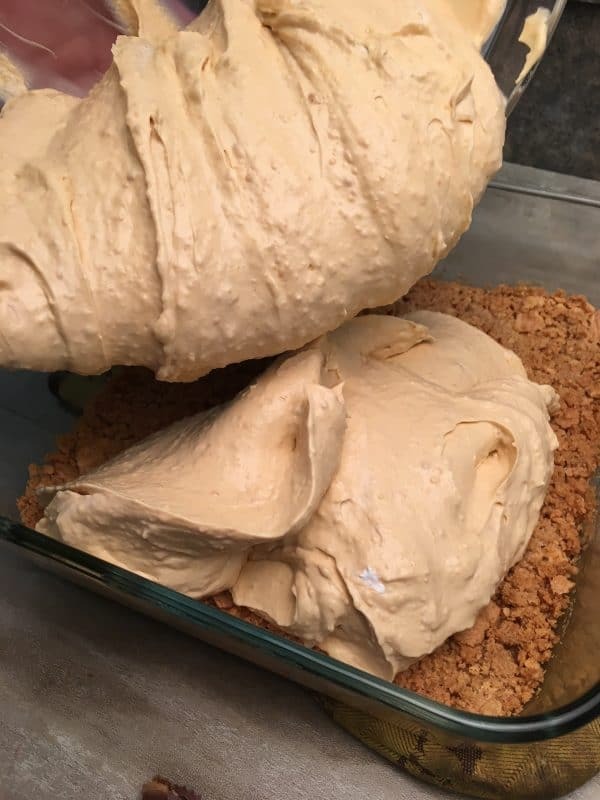 Add the melted butter to the baking dish and mix in with the graham crackers. Press the graham crackers into the dish and bake for approximately 10 minutes, or until golden brown. Melt the peanut butter in a small bowl for approximately 45-seconds. In a large bowl, add the milk, butterscotch and vanilla puddings, and melted peanut butter and mix well until the pudding thickens. 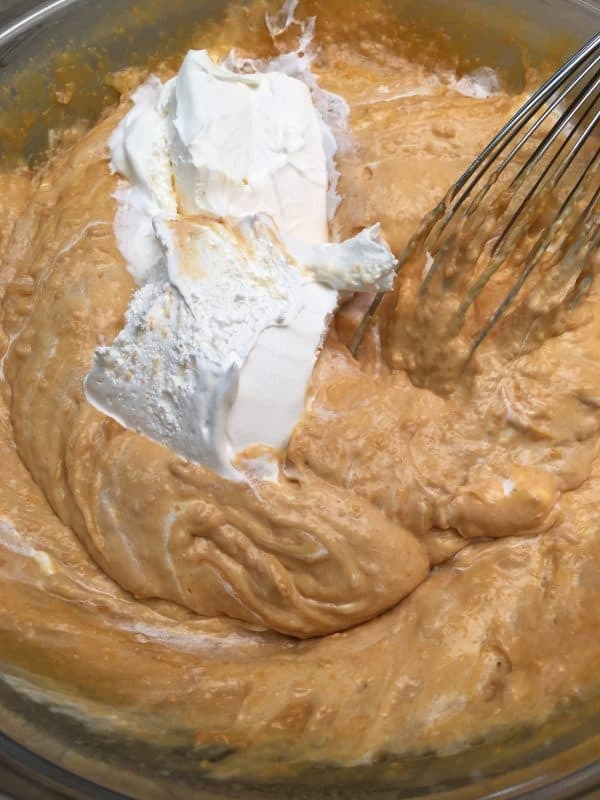 Add the whipped topping and mix well until blended. Pour over the baked graham cracker crust. Cut up Reese's Peanut Butter Cups into smaller pieces. 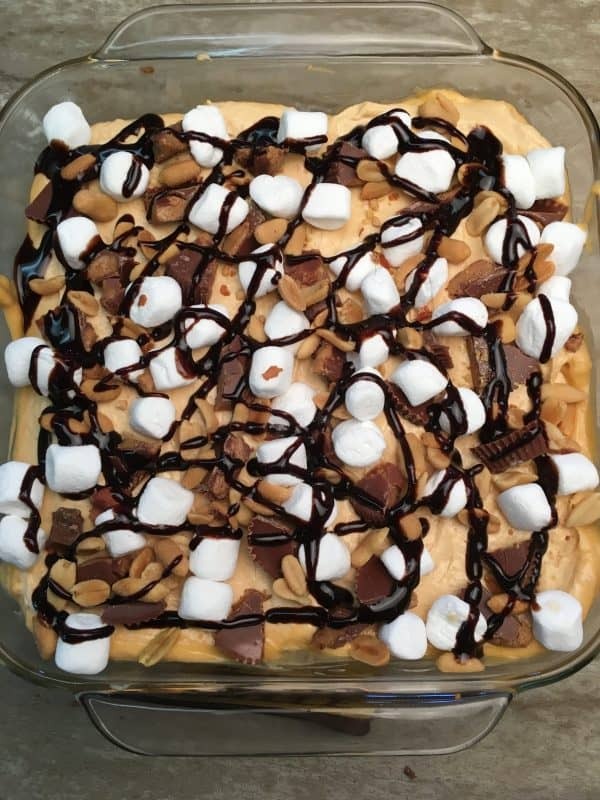 Top with marshmallows, peanuts, Reese's Peanut Butter Cups, and chocolate syrup. Let thaw approximately 20 minutes before cutting and serving. Julie, this recipe looks yummy. I’d definitely have to take a piece if I saw it òn a dessert table! Oh my goodness, thanks for pointing that out! I added it to the recipe. I think I read over the recipe five time to check it, so it helps to have a second set of eyes.